Welcome to the largest freely available Flight Instructor website devoted to all levels of pilot certification. If you're a beginner, learning to fly is one of the most challenging but rewarding experiences you can ever have. Less than 1% of the US population has ever earned a private certificate. The list of active pilots (current medical) brings that to less than a tenth of one percent of the US population. Even fewer are helicopter pilots. Your choice puts you in the most exclusive club in the world. Want a career? 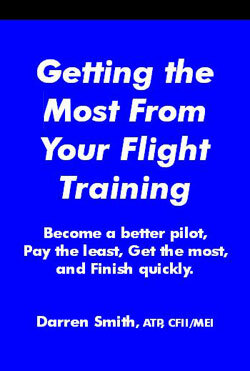 Read why It's a good time to become a pilot. Your first step in learning to fly is to connect with a local flight instructor. With good instruction, you can easily achieve your dream. Your flight training begins with a Certificated Flight Instructor (CFI). This person is vital resource as you achieve your goal. Since flight training is a very intense and personal experience, your selection process is critical to your success. To get started, see Learn to Fly resource page. Further information can be found in the Articles and Private Pilot section. 3) provide helpful aviation links and resources & articles. Thank you for visiting my website. It literally costs thousands of dollars a year to keep this free resource online and expand it. I fund the website from the stuff I sell in the pilot store (take a look) and the advertising links to the right. If you're interested in making sure this resource remains freely available, see how you can support this website. My site receives an enormous amount of traffic, and I'm handling about 160 requests for information weekly (all as a public service). I constantly add content depending on requests & questions I receive, search terms used to find this website, and student experiences. Content is updated & added weekly, so check this website often. I'd love to hear your thoughts to make it better. This site is a US/Canadian based website. Questions from these countries receive top priority. Are you really ready for the checkride? Are you really ready for an IFR Rating? See the reading library for more ideas. CFIDarren Newsletter Archive - now online! "Courage is the price that life extracts for granting peace. The soul that knows it not knows no release from little things ~ Knows not the livid loneliness of fear, or mountain heights, Where bitter joy can hear the sound of wings."